This article focuses mostly on PTLD, which occurs in the context of transplantation. LPDs can occur in individuals infected with HIV, exclusive of LPDs that develop in transplant recipients treated with immunosuppressive drugs or radiotherapy. In patients infected with HIV, LPDs are often linked to infection with Epstein-Barr virus (EBV). Adult Burkitt lymphoma is an EBV-linked LPD that occurs in the context of AIDS. Cutaneous T-cell lymphoma and pseudocutaneous T-cell lymphoma are also LPDs linked to HIV. See the image below. In addition, various LPDs (eg, Castleman disease, Kikuchi-Fujimoto disease, and Rosai-Dorfman disease) can occur in the area of the head and neck in individuals who have not undergone transplantation. The lymphomas and leukemias of AT mirror sporadic LPD but often manifest earlier in life. EBV generally plays an important role in PTLD and particularly in congenital LPDs. PTLDs are an uncommon but serious complication of immunosuppressive therapy after solid-organ transplantation. PTLDs develop in approximately 2-3% of patients who undergo immunosuppressive therapy after solid-organ transplantation. The precise rate of occurrence and incidence depends on the type of organ transplanted and the type and duration of immunosuppressive treatment. PTLDs are a varied class of abnormal lymphoid growths, including both hyperplasias and neoplasias, that are histologically and genetically heterogeneous disorders hallmarked by an abnormal lymphoid cell proliferation. PTLD usually manifests with B-cell proliferation induced by EBV; this proliferation is left unopposed by the pharmacologically suppressed T-cell system. Abnormal lymphoproliferation ranges from a polymorphic form characterized by premalignant hyperplasia to a monomorphic form pathologically indistinguishable from non-Hodgkin lymphoma. The distinction between polymorphic and monomorphic PTLD significantly affects therapeutic decisions because the monomorphic form is usually fatal. Genetic polymorphisms may predispose a patient to the development of PTLD. A few PTLDs are of T-cell origin, Hodgkin type, or, rarely, plasma cell neoplasms such as multiple myeloma. Patients with these types of PLTD are more likely to be EBV negative and usually present later (median onset, 50–60 mo posttransplantation); these disorders are generally more aggressive. Nalesnik also noted that multicentric PTLD may represent either advanced-stage disease or multiple independent primary tumors. Likewise, recurrent PTLD may represent true recurrence or the emergence of a second primary tumor. Transplant recipients are also at risk for other opportunistic neoplasms, including EBV-associated leiomyosarcomas that may be seen alone or in conjunction with PTLD. Studies report varying intervals before onset. Presentation can occur within the first year following transplantation. Loevner et al noted that the interval between transplantation and PTLD onset was 3.5-108 months (mean, 30 mo). The mean time to onset in the UK study was 46 months. The longest interval between transplant and diagnosis was 232 months (nearly 20 y). Younger age and EBV seronegativity appear to increase the risk for PTLD. PTLD is also believed to be more common in children because many children are EBV-naïve at the time of transplantation. Lattyak et al (1998) believe that the incidence of head and neck PTLD in pediatric transplant recipients has been underappreciated. Their experience suggests that almost 10% of pediatric patients who undergo liver transplantation eventually develop PTLD in the head and neck. Remarkably, head and neck involvement represents nearly two thirds of all cases of PTLD in the pediatric population, with the Waldeyer ring being the most common site of involvement. The diagnosis of PTLD requires evaluation of histopathologic appearance, cell phenotype, clonal status, and EBV status. Some suggest that the diagnosis of PTLD can be confirmed based on histologic evidence of invasive lymphoid hyperplasia along with positive tissue staining for EBV via either immunoperoxidase for latent membrane protein (LMP-1) or in situ hybridization for EBV-encoded messenger RNA (EBERs). Walton (2007) reported on the examination of an 8-year-old boy, 3 months after bone marrow transplantation with bilateral enlarged gelatinous bulbar conjunctiva. Conjunctival biopsy demonstrated a polymorphous infiltrate of lymphoid cells with large atypical immunoblastic lymphoma cells, plasmacytoid lymphocytes, and plasma cells. B-cell markers CD20 and CD79a were positive. Plasma cells showed restriction for kappa immunoglobulin light chain and were positive for CD79a. Most cells were positive for Epstein-Barr virus (EBV)–encoded ribonucleic acid. EBV-related polymorphic PTLD was diagnosed and treated with discontinuation of cyclosporine, reduction in prednisone dosage, and administration of EBV-specific cytotoxic T lymphocytes. The conjunctival lesions resolved over 5 weeks. Nalesnik notes that transplant recipients, like other patients with profound immunosuppression, may develop nonneoplastic mass lesions, or they may develop tumors other than those caused by posttransplantation lymphoproliferative disorder (PTLD). Episodes of suspected allograft rejection can be manifestations of allograft-restricted PTLD or may be due to concurrent acute rejection and PTLD. Clinical recurrence of PTLD may reflect reemergence of the original neoplasm, development of a separate tumor clonal neoplasm, or the appearance of a completely unrelated neoplasm. Rearrangements of the c-myc protooncogene are present in some patients with PTLDs. At least 90% of PTLDs that develop following solid-organ transplantations arise from recipient cells. Immunosuppressive medications are a factor. BCL6 mutations are found in 40% of patients with polymorphic PTLDs. Nalesnik (2001) stated that PTLD is best diagnosed with tissue biopsy. Cytological preparations are useful, particularly in the analysis of effusions, and can provide adequate diagnostic material, particularly if ancillary studies such as phenotypic, clonal, and viral analyses are also obtained. Nalesnik also noted that PTLDs may contain large necrotic areas and that excision of involved lymph node or tumor is preferred over a needle biopsy; however, in many cases, a needle biopsy sample may be the only source of tissue available. If such specimens are compromised by extensive necrosis, examining the necrotic areas and identifying the cell as mononuclear in origin may still be possible. Usually, recuts show at least a few spared tumor cells that resemble the cell ghosts present in areas of coagulative necrosis. Epstein-Barr virus (EBV) stains can usually still be performed on such tissue. Clonal analysis of immunoglobulin genes and tests to determine the presence of EBV may be used to support the diagnosis of PTLD. Clonal analysis may also be required to establish a diagnosis of lymphomatous PTLD of T-cell origin. Molecular analysis of oncogenes and tumor suppressor genes will probably play an important role in the definition of PTLD's behavior in the future. Immunohistochemical marker analysis of PTLD can show positive results for the CD45, CD138, CD20, and CD79a markers and BCL-6. Cross-sectional imaging can reveal complications after transplantation. The imaging features of non-Hodgkin lymphoma in immunocompetent persons differ from those of posttransplant lymphoproliferative disorders (PTLDs) in transplant recipients. The incidence of extranodal disease is low (25%). The frequency of nodal disease is high. Gastrointestinal involvement most commonly involves the stomach. Non-Hodgkin lymphoma usually results from direct extension from the involved nodes. Renal involvement is bilateral in 75% of cases. Diffuse infiltration of the liver is the most common form of involvement; focal involvement occurs in less than 10% of patients. Neck involvement usually manifests as a solid mass that grows exophytically into the airway lumen. Necrosis is rare. The incidence of extranodal disease is high (80%). The incidence of nodal disease is low (20%). The small bowel is the predominant site of gastrointestinal involvement. Primary disease is more common. Renal PTLD is usually unilateral and rarely bilateral. Periportal lymphomatous infiltration after liver transplantation is unique to PTLD. Focal disease is more common. Neck involvement is necrotic in up to 50% of patients and may mimic an abscess. This necrosis tends to extend submucosally into the parapharyngeal space. More aggressive forms of PTLD, monomorphic types in particular, may not respond to any treatment. Early diagnosis optimizes response to treatment. Note that erythromycin increases cyclosporine levels; thus, erythromycin and other medications that affect the A3P4 isoenzyme should be used with care and foreknowledge in patients who receive cyclosporine. Koch (2007) analyzed 621 liver transplant recipients in which 22 cases of PTLD were discovered in 21 patients. Five patients were children and 16 were adults. Extranodal disease was present in 77% of cases involving a wide variety of organ systems. Lymphadenopathy was present in 23% of cases. The spectrum of PTLD histopathology varied. In situ hybridization for EBV showed negativity in 62% of cases and was positive in 38% of cases. EBV status did not influence the time interval from transplantation to presentation (median 33 months) or the mortality (average 32%). Green JD Jr, Neel HB 3rd, Witzig TE. Lymphoproliferative disorders of the head and neck. Am J Otolaryngol. 1991 Jan-Feb. 12(1):26-32. [Medline]. Al Ajroush N, Rafique Sheikh K, Kadry R, Almutawa A, Alfadley A. T-cell lymphoma/Sézary syndrome in a liver transplant recipient. J Cutan Med Surg. 2012 Jan-Feb. 16:68-71. [Medline]. Marsot-Dupuch K, Quillard J, Meyohas MC. Head and neck lesions in the immunocompromised host. Eur Radiol. 2004 Mar. 14 Suppl 3:E155-67. [Medline]. Nalesnik MA. The diverse pathology of post-transplant lymphoproliferative disorders: the importance of a standardized approach. Transpl Infect Dis. 2001 Jun. 3(2):88-96. [Medline]. Bates WD, Gray DW, Dada MA, et al. Lymphoproliferative disorders in Oxford renal transplant recipients. J Clin Pathol. 2003 Jun. 56(6):439-46. [Medline]. Loevner LA, Karpati RL, Kumar P, et al. Posttransplantation lymphoproliferative disorder of the head and neck: imaging features in seven adults. Radiology. 2000 Aug. 216(2):363-9. [Medline]. Miller WT Jr, Siegel SG, Montone KT. Posttransplantation lymphoproliferative disorder: changing manifestations of disease in a renal transplant population. Crit Rev Diagn Imaging. 1997 Dec. 38(6):569-85. [Medline]. Hanasono MM, Parrett BM, Breitbart AS. Posttransplant lymphoproliferative disorder presenting as a cutaneous forehead mass. Otolaryngol Head Neck Surg. 2004 Mar. 130(3):372-4. [Medline]. Lattyak BV, Rosenthal P, Mudge C, et al. Posttransplant lymphoproliferative disorder presenting in the head and neck. Laryngoscope. 1998 Aug. 108(8 Pt 1):1195-8. [Medline]. Walton RC, Onciu MM, Irshad FA, et al. Conjunctival posttransplantation lymphoproliferative disorder. Am J Ophthalmol. 2007 Jun. 143(6):1050-1. [Medline]. Saadat A, Einollahi B, Ahmadzad-Asl MA, et al. Posttransplantation lymphoproliferative disorders in renal transplant recipients: report of over 20 years of experience. Transplant Proc. 2007 May. 39(4):1071-3. [Medline]. Muchtar E, Kramer MR, Vidal L, Ram R, Gurion R, Rosenblat Y, et al. Posttransplantation lymphoproliferative disorder in lung transplant recipients: a 15-year single institution experience. Transplantation. 2013 Oct 15. 96(7):657-63. [Medline]. Morscio J, Dierickx D, Ferreiro JF, et al. Gene expression profiling reveals clear differences between EBV-positive and EBV-negative posttransplant lymphoproliferative disorders. Am J Transplant. 2013 May. 13(5):1305-16. [Medline]. Luskin MR, Heil DS, Tan KS, et al. The Impact of EBV Status on Characteristics and Outcomes of Posttransplantation Lymphoproliferative Disorder. Am J Transplant. 2015 Oct. 15 (10):2665-73. [Medline]. Tiede C, Maecker-Kolhoff B, Klein C, Kreipe H, Hussein K. Risk factors and prognosis in T-cell posttransplantation lymphoproliferative diseases: reevaluation of 163 cases. Transplantation. 2013 Feb. 95:479-88. [Medline]. Schober T, Framke T, Kreipe H, et al. Characteristics of early and late PTLD development in pediatric solid organ transplant recipients. Transplantation. 2013 Jan 15. 95(1):240-6. [Medline]. Sano H, Fujimoto M, Okuno K, et al. Epstein-Barr virus-associated posttransplant lymphoproliferative disorder involving the central nervous system following autologous hematopoietic stem cell transplantation for neuroblastoma. Springerplus. 2014 Oct 6. 3:582. [Medline]. Vargas H, Nazeer T, Conti D, et al. Posttransplant lymphoproliferative disorder of the nasopharynx. Am J Rhinol. 2002 Jan-Feb. 16(1):37-42. [Medline]. Knowles DM, Cesarman E, Chadburn A, et al. Correlative morphologic and molecular genetic analysis demonstrates three distinct categories of posttransplantation lymphoproliferative disorders. Blood. 1995 Jan 15. 85(2):552-65. [Medline]. Nador RG, Chadburn A, Gundappa G, et al. Human immunodeficiency virus (HIV)-associated polymorphic lymphoproliferative disorders. Am J Surg Pathol. 2003 Mar. 27(3):293-302. [Medline]. Tsai DE, Reshef R. Shaping the Molecular Landscape of Posttransplantation Lymphoproliferative Disorders. Am J Transplant. 2016 Feb. 16(2):379-380. [Medline]. Meriden Z, Bullock GC, Bagg A, Bonatti H, Cousar JB, Lopes MB, et al. Posttransplantation lymphoproliferative disease involving the pituitary gland. Hum Pathol. 2010 Jul 23. [Medline]. Akhtar R, Yusuf NW, Khalid S, Nadeem I, Sarfaraz R, Imran M. Posttransplantation lymphoproliferative disorder with skin involvement. J Coll Physicians Surg Pak. 2010 Jan. 20:62-4. [Medline]. Moir JA, Simms RJ, Wood KM, Talbot D, Kanagasundaram NS. Posttransplant lymphoproliferative disorder presenting as multiple cystic lesions in a renal transplant recipient. Am J Transplant. 2012 Jan. 12:245-9. [Medline]. Rombaux P, Marque A, Hamoir M, et al. Post-transplant lymphoproliferative disorder with supraglottic involvement. B-ENT. 2005. 1(1):53-6. [Medline]. Frizzera G, Hanto DW, Gajl-Peczalska KJ, et al. Polymorphic diffuse B-cell hyperplasias and lymphomas in renal transplant recipients. Cancer Res. 1981 Nov. 41(11 Pt 1):4262-79. [Medline]. Harris NL, Ferry JA, Swerdlow SH. Posttransplant lymphoproliferative disorders: summary of Society for Hematopathology Workshop. Semin Diagn Pathol. 1997 Feb. 14(1):8-14. [Medline]. Scarsbrook AF, Warakaulle DR, Dattani M, et al. Post-transplantation lymphoproliferative disorder: the spectrum of imaging appearances. Clin Radiol. 2005 Jan. 60(1):47-55. [Medline]. Ga Young Yoon, Mi Young Kim, Joo Rryung Huh, Kyung-Wook Jo, Tae Sun Shim. 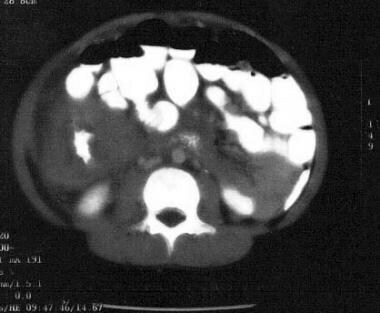 Posttransplant Lymphoproliferative Disorder of the Thorax: CT and FDG-PET Features in a Single Tertiary Referral Center. Medicine (Baltimore). 2015 August. 94(31):e1274. [Medline]. Camacho JC, Moreno CC, Harri PA, Aguirre DA, Torres WE, Mittal PK. Posttransplantation lymphoproliferative disease: proposed imaging classification. Radiographics. 2014 Nov-Dec. 34(7):2025-38. [Medline]. Reshef R, Vardhanabhuti S, Luskin MR, et al. Reduction of immunosuppression as initial therapy for posttransplantation lymphoproliferative disorder(?). Am J Transplant. 2011 Feb. 11(2):336-47. [Medline]. [Full Text]. Végso G, Hajdu M, Sebestyén A. Lymphoproliferative Disorders After Solid Organ Transplantation-Classification, Incidence, Risk Factors, Early Detection and Treatment Options. Pathol Oncol Res. 2010 Dec 31. [Medline]. Hirokawa M, Kawabata Y, Fujishima N, et al. Prolonged reactivation of cytomegalovirus infection following successful rituximab therapy for Epstein-Barr virus-associated posttransplantation lymphoproliferative disorder. Int J Hematol. 2007 Oct. 86(3):291-2. [Medline]. Choquet S, Varnous S, Deback C, et al. Adapted treatment of Epstein-Barr virus infection to prevent posttransplant lymphoproliferative disorder after heart transplantation. Am J Transplant. 2014 Apr. 14(4):857-66. [Medline]. Koch DG, Christiansen L, Lazarchick J, et al. Posttransplantation lymphoproliferative disorder--the great mimic in liver transplantation: appraisal of the clinicopathologic spectrum and the role of Epstein-Barr virus. Liver Transpl. 2007 Jun. 13(6):904-12. [Medline]. Mucha K, Foroncewicz B, Niemczyk K, et al. Tonsil enlargement after liver transplantation in adults--reason enough for tonsillectomy? Two cases of tonsillar posttransplantation lymphoproliferative disease. Liver Transpl. 2007 Jun. 13(6):918-23. [Medline]. Doria C, Marino IR, Scott VL, et al. Posttransplant lymphoproliferative disorders presenting at sites of previous surgical intervention. Transplantation. 2003 Apr 15. 75(7):1066-9. [Medline]. Landgren O, Gilbert ES, Rizzo JD, Socié G, Banks PM, Sobocinski KA, et al. Risk factors for lymphoproliferative disorders after allogeneic hematopoietic cell transplantation. Blood. 2009 May. 20:4992-5001. [Medline]. [Full Text]. Marques E, Jimenez C, Manrique A, Vallejo GH, Clemares M, Ortega P, et al. Development of lymphoproliferative disease after liver transplantation. Transplant Proc. 2008 Nov. 9:2988-9. [Medline]. Mowry SE, Strocker AM, Chan J, Takehana C, Kalantar N, Bhuta S, et al. Immunohistochemical analysis and Epstein-Barr virus in the tonsils of transplant recipients andhealthy controls. Arch Otolaryngol Head Neck Surg. 2008 Sep. 9:936-9. [Medline]. Nouwen J, Smets F, Rombaux P, et al. Acute tonsillitis as the first manifestation of post-transplant lymphoproliferative disorder. Ann Otol Rhinol Laryngol. 2002 Feb. 111(2):165-8. [Medline]. Pickhardt PJ, Wippold FJ 2nd. Neuroimaging in posttransplantation lymphoproliferative disorder. AJR Am J Roentgenol. 1999 Apr. 172(4):1117-21. [Medline]. Porter CC, Liang X, Gralla J, McGavran L, Albano EA. BCL6 expression correlates with monomorphic histology in children with posttransplantationlymphoproliferative disease. J Pediatr Hematol Oncol. 2008 Sep. 9:684-8. [Medline]. [Full Text]. Srisawat N, Avihingsanon A, Praditpornsilpa K, Jiamjarasrangsi W, Eiam-Ong S, Avihingsanon Y. A prevalence of posttransplantation cancers compared with cancers in people with humanimmunodeficiency virus/acquired immunodeficiency syndrome after highly active antiretroviraltherapy. Transplant Proc. 2008 Oct. 8:2677-9. [Medline]. Tsao L, Hsi ED. The clinicopathologic spectrum of posttransplantation lymphoproliferative disorders. Arch Pathol Lab Med. 2007 Aug. 131(8):1209-18. [Medline]. Wu JF, Ho MC, Ni YH, et al. Timing of Epstein-Barr virus acquisition and the course of posttransplantation lymphoproliferative disorder in children. Transplantation. 2009 Mar. 5:758-62. [Medline]. Xu QS, Ye S, Zhou YQ, Sheng JF, Ye K, Zheng SS. Posttransplantation lymphoproliferative disorder involving the central nervous system in livertransplant recipients. Hepatobiliary Pancreat Dis Int. 2008 Oct. 5:551-4. [Medline]. Chi Young Ok, Ling Li, Ken H Young. EBV-driven B-cell lymphoproliferative disorders: from biology, classification and differential diagnosis to clinical management. Exp Mol Med. 2015 January. 47(1):e132. [Medline].